I thoroughly enjoyed the back-and-forth flow of ideas that we had over email, and it’s interesting that Jesse and her crew seemed to respond most strongly to the more instinctive, less deliberate drawings that I presented to them. Jesse loved some of the ideas involving a paper airplane, but ultimately we all agreed on the image that you see above as the one that best encapsulated the mood of the song. What I really like about the lyrics is that the listener walks away with a clear sense of what the narrator is feeling, but the intended recipient of the love letter remains elusive; her own feelings about finally being released from jail a mystery. I really wanted these ambiguities to come across in the finished image, while opening ample room for interpretation. I also have to come clean and admit that this drawing was inspired as much by the work of Edward Gorey (which seemed to be a good reference point) as by the shimmering, daydream-inducing haze of Belle Ghoul’s music. 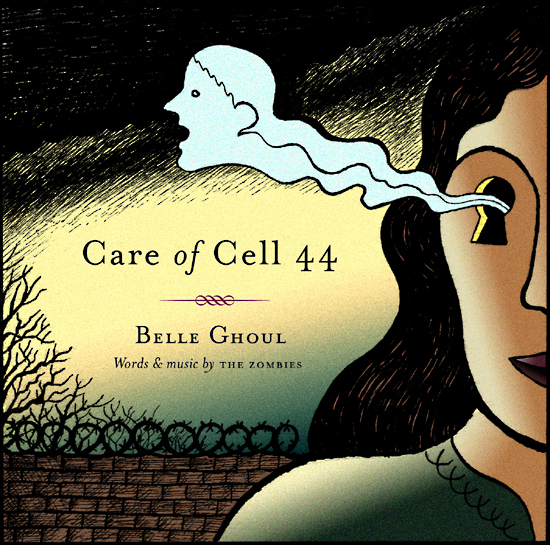 If you’re curious enough to have a listen (of course you are), we invite you to stream and download Belle Ghoul’s cover of Care of Cell 44 through their Soundcloud page, all free of charge. Yesterday, shortly after the song went up online, we learned that Colin Blunstone himself (the Zombies’ lead vocalist/lyricist) gave his blessings!! !